What are the top 10 spices you MUST HAVE in your cupboard? Great question Lynn! And very smart of you to not just go grab a whole bunch at once! I’d get the ones listed below, then slowly add some of the more exotic spices as you can fit them into your budget. These are most commonly used in budget cooking and ones I can’t live without! So that’s way more than 10…but it’ll get you started!!! What are the must have spices in your pantry?! My spice cabinet looks like a spice store, so it would be really hard for me to just pick 10! That said, I’ve never used poultry seasoning on anything. 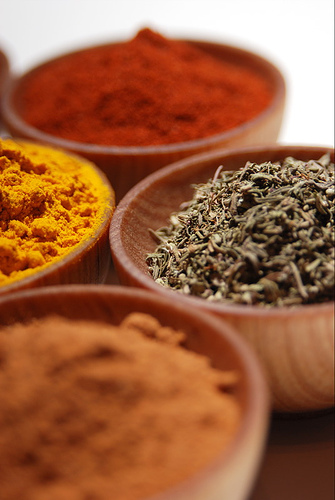 I think that having the individual herbs/spices – like for the taco seasoning – is more important than having blends. And I wouldn’t want to live without cinnamon! Chili powder, a couple of savory spices, a couple of baking spices, Italian seasoning blend. With those on hand I can usually substitute if I’m lacking something specific. My biggest spice revolution has been buying spices from bulk bins at my local co-op. They cost a fraction of the price, and you can be sure that nothing sits in the cupboard for too long, since you only need to buy as much as you need (or just a little extra). I couldn’t live without dill, garlic powder and cinnamon. I try to buy Penzey’s spices whenever I can…especially for the ones I listed above. The flavors are AMAZING and their prices are similar or just a little more than those in grocery stores, but well worth it! I would rather use fresh garlic and ginger than dried. The only time I used dried ginger is when making cookies. I have many more, but those are the ones I use the most. I have lots of others, but these are the ones I go thru the fastest. I have a whole spice cabinet too! When we redid our kitchen I made a big spice cabinet next to my stove and I sized all the shelves to fit my bulk spice containers. It’s 4 shelves tall! PLUS, I have another entire shelf in my walk-in pantry devoted to stocking spices. (The link above has my entire spice list). I get lots of my spices in bulk from Sam’s Club, and then I order the rest online from Herb Products Co. (though I am considering ordering some from another bulk online store next time). I love my spices, too. I buy them in bulk from a local store, and I find them pretty affordable. THANK YOU SOOOO MUCH! I am still unpacking from the move, but I cannot wait to start cooking and getting all my new spices. When I packed I found spices that were at least 10 years old – YUCK! It is hard to name only 10 must haves but cumin and cinnamon are at the very top of the list. Chili powder, oregano, fresh black peppcorns, bay leaves, basil, cloves, garlic powder and whole nutmegs are definite keepers as well. Mostly, the only item I really don’t care for is rosemary-I feel like I am eating a tree. Currnetly I have 45 small viles of spices that I refill from a bulk spice store as I need them. That way I don’t have to pay for what I don’t need and nothing ever loses its freshness! I use a spice rack and it is kept on my counter. After awhile my green spices (oregano, chives, etc..) turn brown. Is this caused by light? Do green spices last longer in a cabinet?